I always enjoy trying to improve the functionality and or update / repair the instruments i own but recently I have been in the process of taking on more repair work for other people. This can be intimidating but i like the challenge and i always learn something. Some friends of mine had a Juno 106 that finally died after years of touring and gigging. 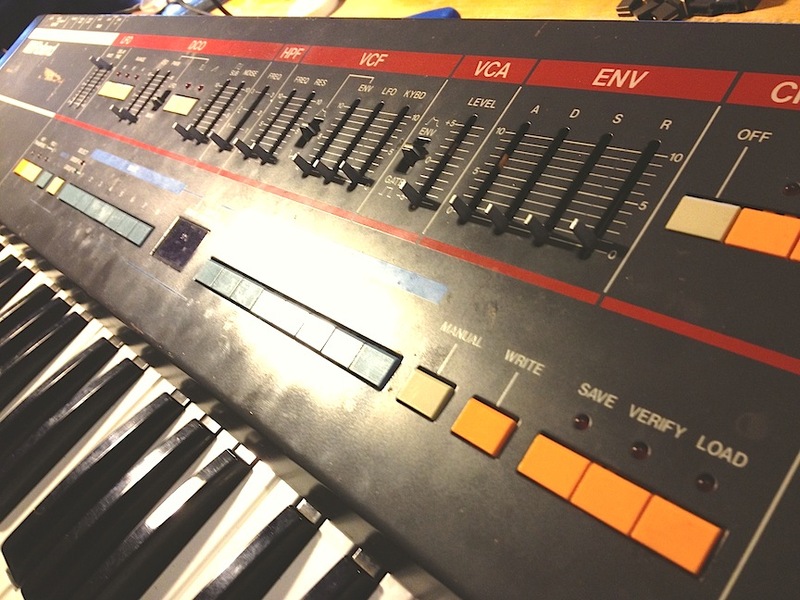 Apparently this Juno 106 was a frankenstein made out of 2 previously corpse-d Juno 106's that the band had been using previously. 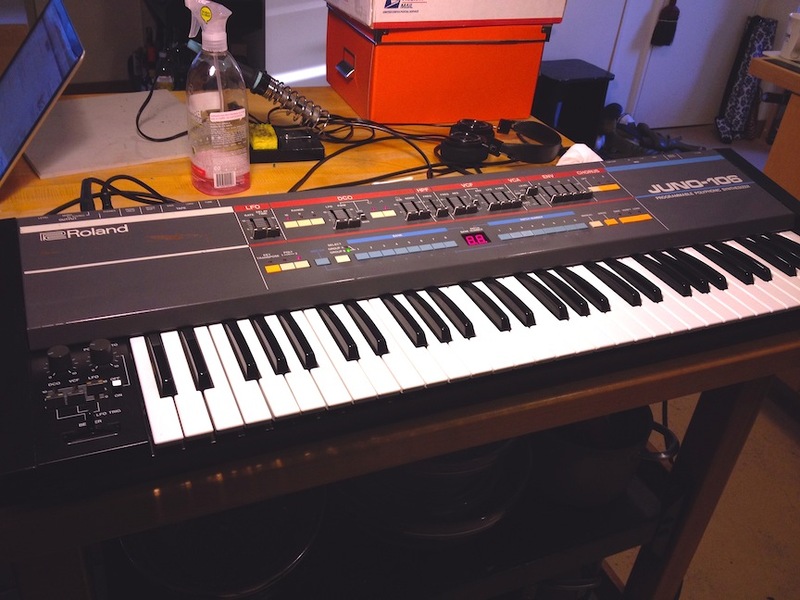 Amazing and yet common story for the Roland Juno 106 as they have parts that are bound to fail and there's many of them in circulation. When i received the Juno it was totally deceased. It wouldn't even turn on. As i started at the beginning ( the power supply ) i began a long journey that took me to every board in this beast. 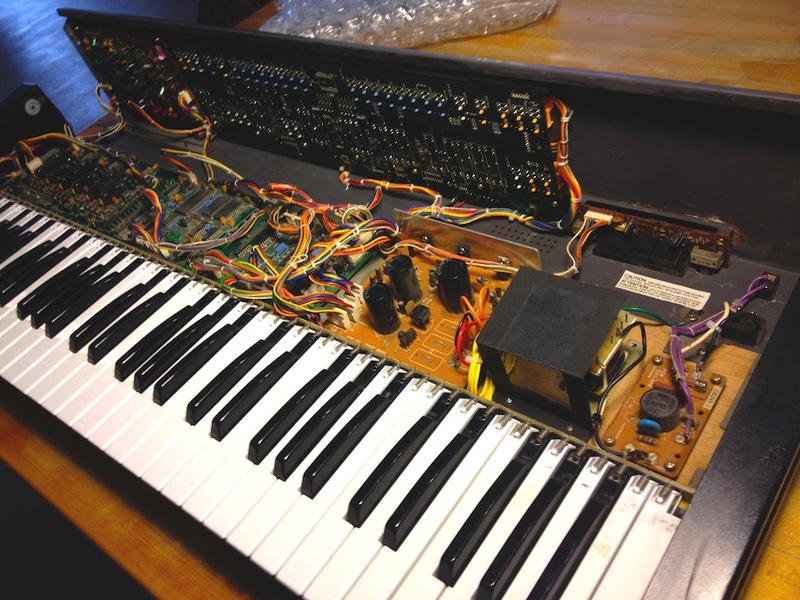 As will many Rolands of that era, the Juno 106 is nicely made and laid out inside. it's relatively easy to work on and retains the Roland style of sophistication and simplicity. The AC wires from the receptacle to the PSU were rotted out so i replaced them. After that step i noticed that the power transformer was toasted. Once i sourced a replacement transformer from a parts machine ( Roland HS-60 that someone had pulled the voice chips from previously) i at least had some voltage! But thats where i met my next obstacle. The regulators on the supply were down. This an easy fix and i soon had AC to DC conversion at all the required voltages from the PSU. When i reconnected all the other boards the regulators immediately started overheating . This was a bad sign and meant that the other boards had problems yet to be deciphered. I reconnected each board one at a time and found out that the Voice Module board ( the most important one! ) was shorting out the power supply. A little research informed me that when the 'Voice' chips in Juno 106's fail they sometimes become a short that persists. It doesn't cause the unit to shut down or the fuse to blow. It just goes supernova! Based on how hot it was getting within minutes i can see what had brought this instrument down. 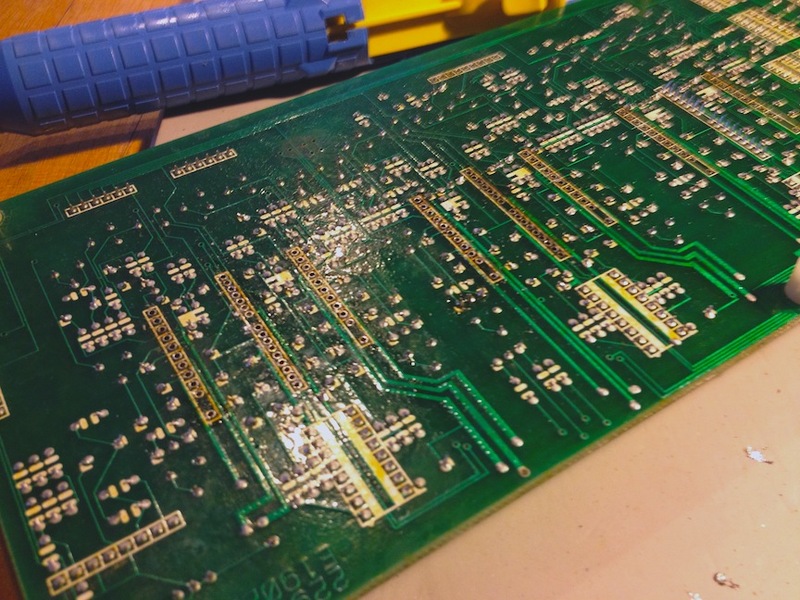 The short had occurred in the module board and the power supply allowed so much current to pass that the regulators and the power supply were destroyed! Pretty catastrophic! This probably didn't take long either and it was only minutes from when the synth stopped making sound at a gig until it had melted itself to death. Side note, There were several problems i eventually addressed to bring this baby back to club awesome. 1, The bender assembly was trashed and just sloppily banging around inside the bender housing. 3, One of the voices was dead. And once i got that sorted the CPU on the voice module board was toasted and wouldn't trigger voices properly. 4, The power supply and transformer were dead. 5, The jack board where the outputs live had issues too as there was no audio from the main outs but the headphone jack had been working. So it took a lot of research and work but this instrument is now rockin' again! I've burned it in for 24 hours and it still sounds great so it's time to release it to the wild! 1, The power transformer was blown and replaced. 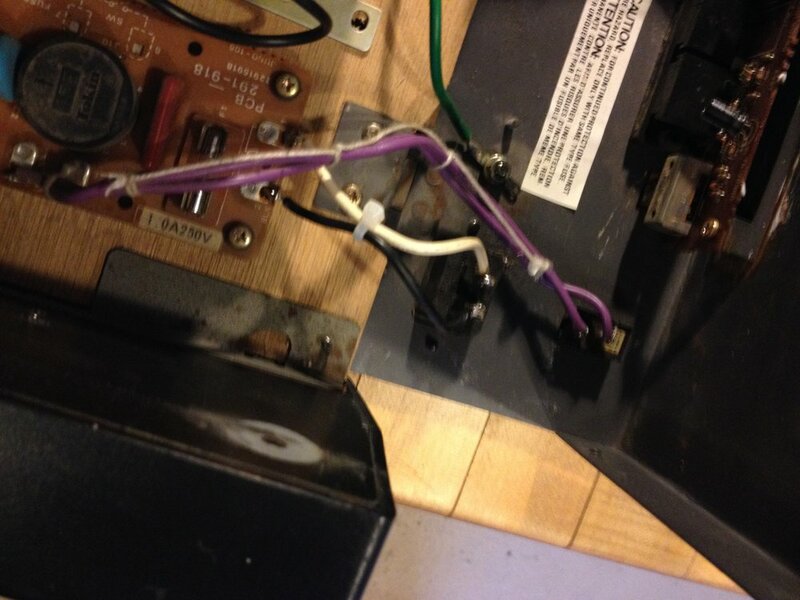 2, The voltage regulators in the power supply were toasted and replaced. 3 The CPU on the voice board was toasted and has been replaced. 4, The bender assembly was broken and has been replaced. 5, The 2 broken sliders have been replaced and have original matching caps as well. 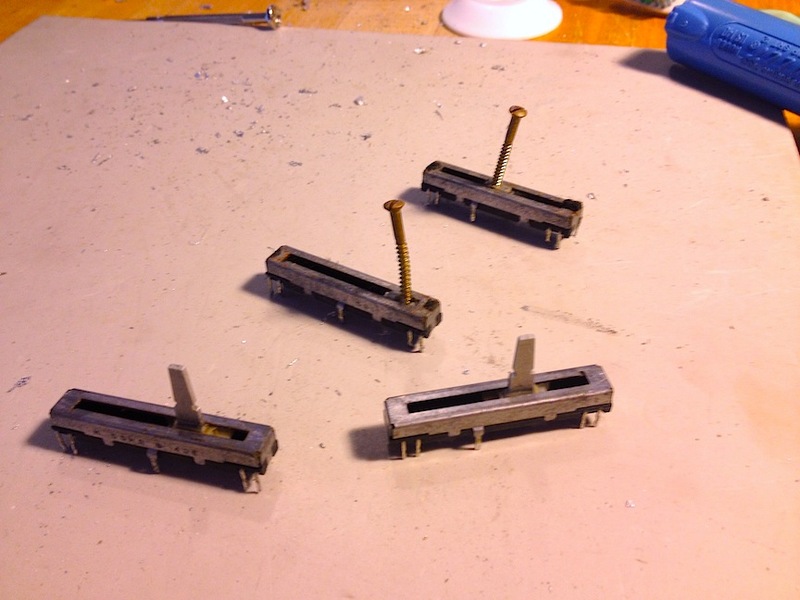 i also lubed all the faders with teflon fader grease so they feel less gritty and more similar. 6, There was blown parts in the jack board that were replaced ( hum and dead outputs ) and all the outputs are now making music! 7, The power cable input could not be switched to IEC 3 prong because there is not enough room to put a deeper receptacle in without being dangerously close to exposed AC points. 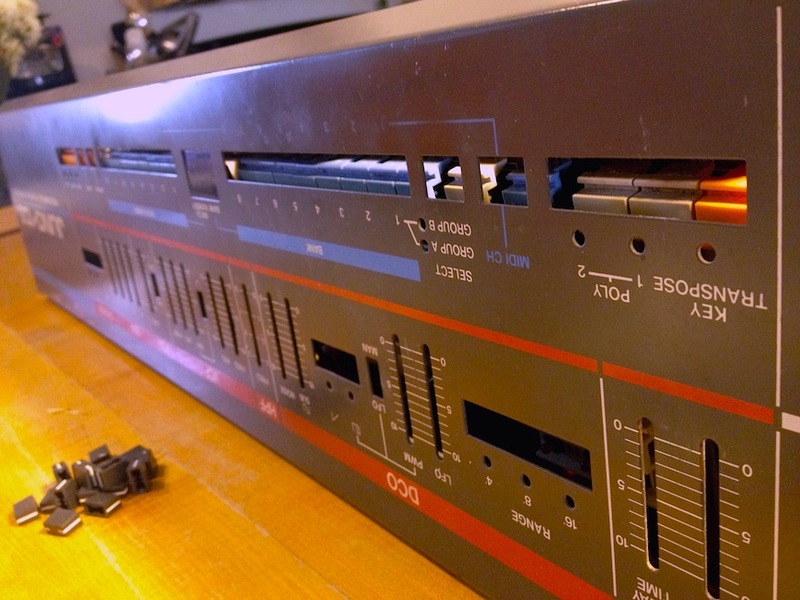 8, The main culprit of this catastrophe was a dead 'voice' chip ( Roland 80017A ). When these go they sometimes become a short. this is what took down the power supply and many of the other parts that needed replacement. 9, lastly, i replaced the end cap chassis screws so this synth will be more structurally stable and hopefully last another 30 years! I forgot how specific the 106 vibe was. Too bad they are so prone to failure. As always, thanks to Doug at synthparts for synth parts!